Bitmain Technologies Ltd., the world’s biggest producer of cryptocurrency mining chips, is planning a Hong Kong initial public offering that could raise as much as $3 billion, people with knowledge of the matter said. The Beijing-based company, whose 32-year-old co-founder Jihan Wu is one of the most powerful players in crypto, plans to file a listing application with the Hong Kong stock exchange as early as September, according to the people. Bitmain closed a private funding round in the past few weeks valuing the company at about $15 billion, one of the people said, asking not to be identified because the information is private. 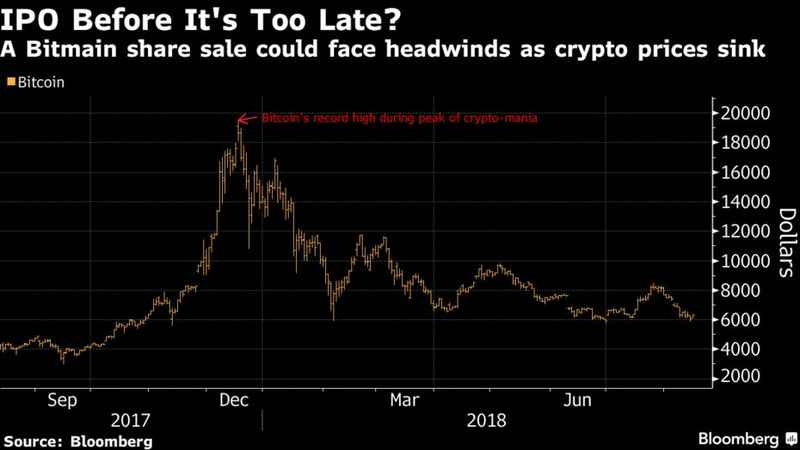 If the IPO proceeds as planned, it would represent a major test of investor appetite for digital-currency companies after the market value of Bitcoin and its peers tumbled by more than 75 percent since early January. A successful listing would be a landmark event for the crypto industry, which is increasingly trying to move from the fringes of finance into the mainstream. For Bitmain — which is estimated to control as much as 80 percent of the market for crypto mining gear — an IPO may also mark a step toward a future beyond crypto. Wu, who co-founded the company in 2013, has said he wants to branch out into areas such as artificial intelligence. A listing could give Bitmain the extra funding and public profile it needs to pursue other businesses. Jihan Wu on May 18. “The challenge is advancing our technology beyond what we’ve already achieved,” Wu said in an interview with Bloomberg in May. Bitmain’s bread and butter is designing custom chips known as application-specific integrated circuits, or ASICs. These are particularly good for the brute-force number crunching required by cryptocurrency miners, who verify virtual currency transactions and earn crypto-denominated rewards by solving complex math problems. ASICs are also useful for the heavy workloads associated with some forms of AI, such as machine learning. 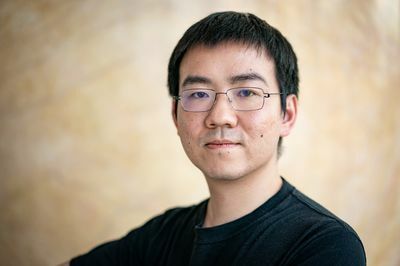 Wu said in the May interview that Bitmain booked $2.5 billion of revenue last year and that he and co-founder Micree Zhan together owned about 60 percent of the business. He added at the time that he was open to a listing in Hong Kong — or in an overseas market with U.S. dollar-denominated shares — in part because it would give early investors including Sequoia Capital and IDG Capital a chance to cash out. Details of Bitmain’s listing haven’t been finalized, and its fundraising target could change, the people said. Nishant Sharma, a Beijing-based spokesman for Bitmain, declined to comment. Speculation about Bitmain’s IPO plans and finances has intensified in recent days. The cryptocurrency news site CoinDesk reported on Aug. 10 that Bitmain was seeking to raise as much as $18 billion in an IPO, citing documents it had obtained. Unverified investor presentations purporting to show details of Bitmain’s business have been circulating online, prompting discussions in crypto circles over the company’s exposure to falling virtual currency prices. While Bitmain gets most of its revenue from mining equipment sales, it also runs some of the world’s biggest mining collectives, in which members combine their processing capacity and split the rewards. The company’s outsized role has prompted a backlash from some virtual currency purists, who disdain anything that hints of a concentration of power in the crypto ecosystem. Wu’s support for Bitcoin Cash, an offshoot of Bitcoin, has also stoked controversy. Despite its dominant position, Bitmain will face plenty of competition as it courts investors. Canaan Inc., a maker of crypto mining gear that’s also working on AI applications, has already filed for a Hong Kong IPO. The company will aim to raise about $1 billion, people with knowledge of the matter said in May. Ebang International Holdings Inc., another producer of mining gear, has also disclosed its intention to list in the city. There’s no guarantee investors will pile in, especially given the recent weakness in Hong Kong’s stock market amid jitters over rising interest rates and a U.S.-China trade war. The city’s benchmark Hang Seng Index has dropped 18 percent from this year’s high in January, one of the biggest declines among major markets worldwide over the period.